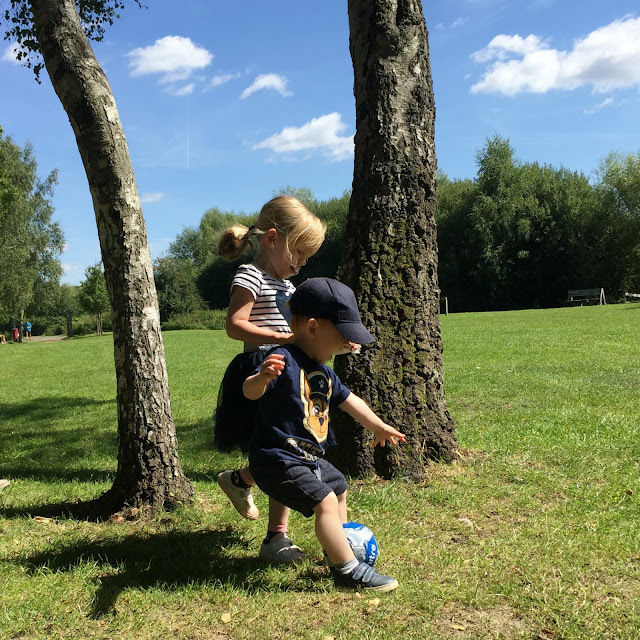 Usually a trip to Ruislip Lido, with it's fun lakeside beach, splash pad and train rides is an instant winner in our home. But not so this Sunday when we went for a walk, brunch and a play on the beach. 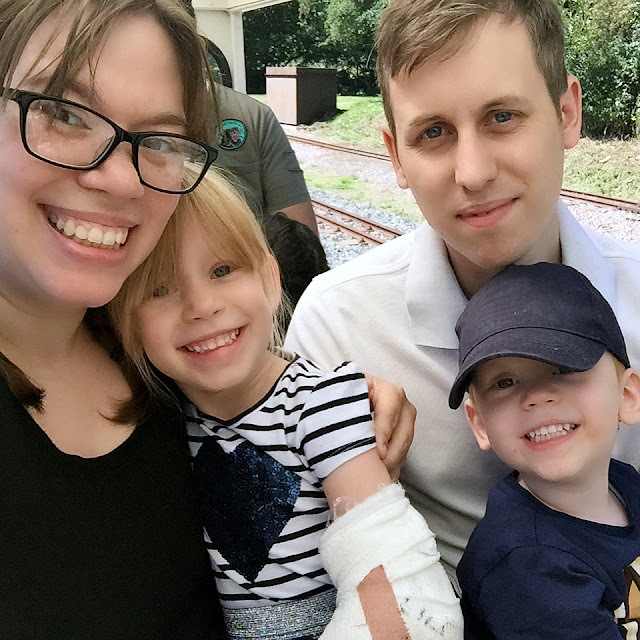 Unfortunately, Lily was held back - by her healing arm, or fear of hurting her arm again, from doing all the things she'd normally want to do. And it may sound a tad dramatic, but it broke my heart. It was lovely to see her walk along the wall and pretend to sell ice creams from the play equipment houses but disappointing for my usually adventurous explorer to see her scared or apprehensive. She wouldn't even go down a slide on her own without holding my hand and it was obvious how upset she was when she told me "I can't climb up there" or "I can't play in the water". Ollie was bravely climbing frames meant for older children and attempting to slide down poles before Daddy could help him but Lily hung back, avoiding even the smallest of play equipment. 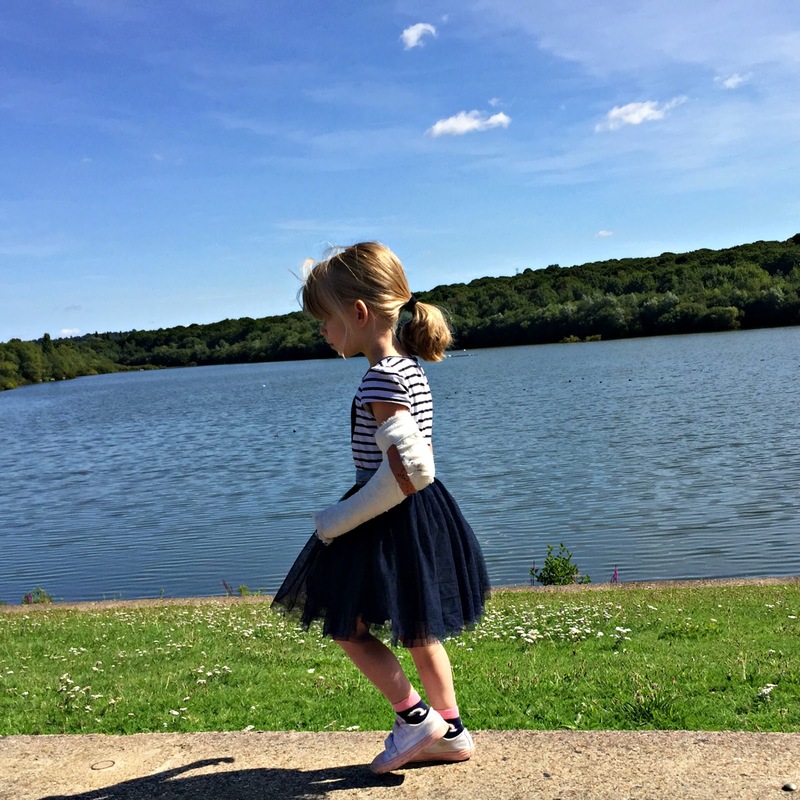 We had brunch, played football, took the train round the lake and had ice creams before heading home. Lily was a bit clingy and enjoyed some parts of the day more than others but I found that I was feeling sensitive and on edge all the time. I felt torn between wanting to encourage her to still run, jump and climb and a desire to wrap her in bubble wrap so she wouldn't get hurt again. If she cried and said she didn't want to walk up the steps in case she got hurt I wanted to encourage her to face her fears and do it anyway. And yet, when she played football I watched with anxiety in case she fell. Where do you draw the line between keeping safe whilst avoiding sowing fear into little minds? How do I balance my own fears for her safety whilst encouraging her to enjoy each activity with enthusiasm? Yesterday we went to see our local consultant and have her cast changed. 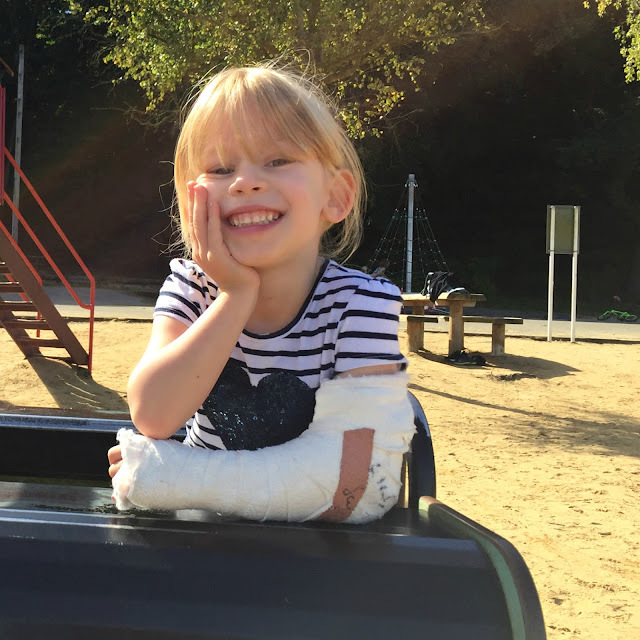 She now has a brightly coloured pink cast that allows her to move her wrist and fingers easier. It means we can buy a waterproof cover now that will allow her to bathe and maybe even go swimming without worrying. After the weekend I found myself Googling the best options I could buy before I'd even left the hospital. At least that issue can be resolved. As for the rest? Well, she'll need general anaesthetic to have the cast and wires removed in a few weeks, we're waiting for the appointment to be sent through. As soon as it's off we'll be back to Ruislip - bringing Lily's new bike with us and climbing with her to the top of the largest frame! I'm hoping by that point the only thing I'll be scared of is the other parents tutting at the adult climbing the kid's equipment.